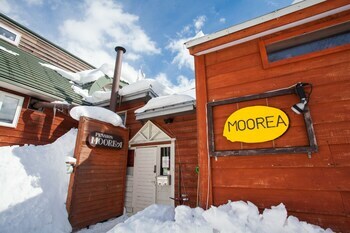 With a stay at Moorea Lodge in Kutchan, you'll be within a 15-minute drive of Niseko Mountain Resort Grand Hirafu and Lake Hangetsu Nature Park. Featured amenities include luggage storage and laundry facilities. Free self parking is available onsite. With a stay at Hotel Diamond in Osaka (Minami), you'll be a 4-minute drive from Tsutenkaku Tower and 9 minutes from Shitennoji Temple. The front desk is staffed during limited hours. When you stay at Wakkanai Grand Hotel in Wakkanai, you'll be within a 10-minute drive of Shingonji Temple and Wakkanai City Komadori Ski Area. Free self parking is available onsite.